Insider trading is what you call it when individuals that work at a company buy stock in their own company. For it to be considered insider trading, these individual must have access to potentially non-public information. Insider trading is not necessarily illegal if those individuals follow the proper ethical principals and regulatory procedures. 'Insiders' are typically corporate officials (e.g., CEOs) and major shareholders. That said, you can't help but think that insiders buying or selling may reflect the health and prospects of a particular company. They are insiders after all and they do have access to non-public information. Lucky for us, insiders must submit their buying and selling to the authorities and we can seek out this information on the SEDI (System for Electronic Disclosure by Insiders) website. Selling under a plan - a mildly negative signal. Selling in public market - a negative signal. Selling exercise of options - a potentially negative signal. In general, I try to look at the big picture. Are all the insiders buying? Are they all selling? How many shares are being bought or sold? Are there many small indicators in one direction but then an overshadowing one in the opposite direction? Also, in general, I think there can be lots of reasons for insiders to sell but to buy is a clear positive indicator. As mentioned, insiders must submit their buying and selling to the authorities and we can search out this information on the SEDI (System for Electronic Disclosure by Insiders) website. Unfortunately, the SEDI website is the poster child for poor website design. Let me take you through an example...by all means though...experiment with the options. 1. Head to www.sedi.ca and click on the language of your choice. 2. 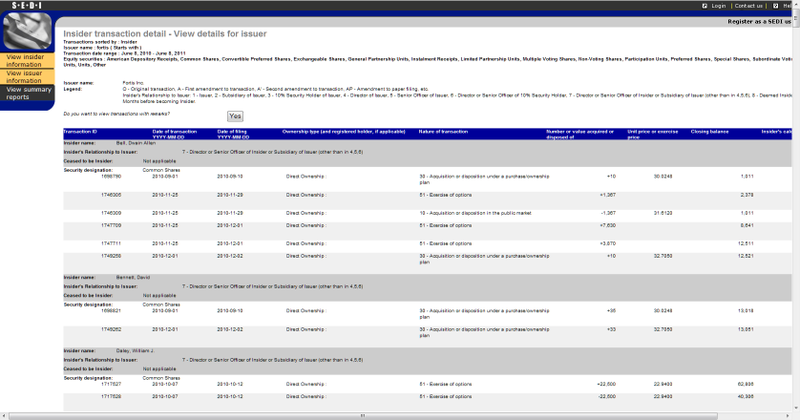 Click on 'Access public filings' near the top right corner. 3. Click on 'View summary reports' on the left hand side. 4. 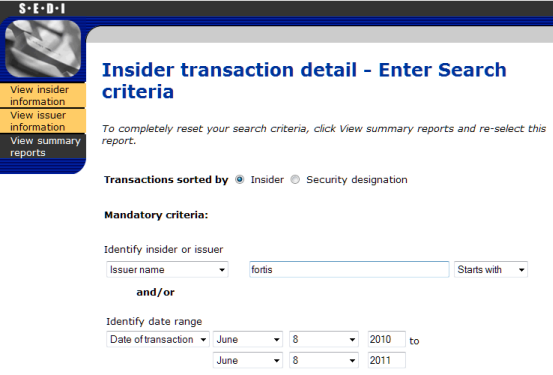 Choose 'Insider transactional detail' and hit the 'Next' button. 5. Under 'Mandatory Criteria' choose 'Issuer name' and enter all or portion of the company name. Sometimes the name is not what you would expect it to be, so be prepared to fiddle with the search options until you find the company you are looking for. In the below screenshot, I typed the word 'fortis' (as I am looking for company Fortis). I also entered a start and end date. 6. On the same page, under 'Optional criteria' and then under 'Equity' press 'Select all'. 7. Scroll to the bottom of the page and press the 'Search' button. 8. A new page will appear listing all possible matches. Click on the 'View' link beside the company you were looking for. After a short wait the results will appear. Image: The results of our search.